Debates over national dividing lines can get heated. Consider the 17th century discussions over the two philosophers John Duns Scotus and John Scottus Eriugena. In 1620, a book by the bishop of Ossory David Rothe, Brigida thaumaturga, was published in Paris. It was on the surface an account of the life of St Brigid of Kildare, but that life is used as a metaphor by Rothe for the medieval mission of the Irish to Europe and of the mission of clergy to Ireland (a Catholic country under Protestant rule). The latter required financial security for Irish seminary students, which was their due (according to Rothe) given the huge contribution the Irish had made to France in the past, scholastically and religiously, including the work of John Scottus Eriugena. Not the type of thing that would have the writer called a “devil”, one might think, but that was not all Rothe wrote. The work also targets Scottish scholar Thomas Dempster who claimed a large number of Irish saints and scholars for Scotland. As the historian Liam Chambers points out, this claim undermined Rothe’s argument for French aid for the Irish and left the Irish Counter-Reformation without native saints. Roth systematically rebutts Dempster’s claims, even going so far as to say all described as “Scotia” or Scots in the Middle Ages are Irish. Dempster’s thesis, published as Historia ecclesiastica gentis Scotorum (1627), was not sound. Not only does he include people as Scottish who probably didn’t exist, he cites books which almost certainly didn’t exist either. The inclusion of Irish saints and scholars as Scottish could be due to confusion, but no such explanation is available for the co-opting of English figures such as St Boniface and Boudicca (Boadicea). Other books he wrote were well regarded, particularly his De Etruria regali, so it seems patriotism is the most likely explanation for his actions in this case (Alexander du Toit, DNB 1888). Dempster was outraged by Rothe’s claim that the term “Scotia” applied only to the Irish. He replied in Scotia Illustrior (1623), calling Rothe “diabolus rabiosus exiens orco” (a mad devil from Hell). Rothe followed up with another reply in Hiberia Resurgens (1721, Rouen). Rothe’s claim for the Scotia as Irish appears again in Thomas Messingham‘s momumental Florilegium Insulæ Sanctorum (1624, Paris), a collection of lives of Irish saints. Messingham, Rector of the Irish College in Paris, wrote the work to encourage Irish Catholics and to build up Ireland’s image as a true nation distinct from England and Scotland. Included is a tract by Rothe (unattributed) on the ancient names for Ireland in historical texts, her role in early medieval Europe and listing a large number of texts calling Ireland Scotia. (Thomas O’Connor). In compiling his lives, Messingham had been in contact with other Irish historians on the continent including the Franciscan Hugh Ward. Ward was working on his own lives of the saints, and arranged for manuscripts to be collected in Ireland by Michael O’Clery and others (even exchanging material with James Ussher, Church of Ireland Bishop of Armagh). This material was arranged and published in part by John Colgan in the 1640s. However the Scotia debate did not go away. An English Franciscan Angelus Mason claimed that John Duns Scotus, the most famous theologian and philosopher of the Franciscan Order, was English, in his Certamen seraphicum provinciae Angliae (1649). Colgan replied to this claim in a biography of Scotus, Tractatus de Vita, Patria, Scriptis Johannis Scoti, Doctoris Subtilis (Antwerp, 1655). Unfortunately he died before he could reply to Mason’s response, the Apologia pro Scoto Anglo(1656).John Punch, who had worked with Luke Wadding in compiling Duns Scotus’ work in Rome, took up the baton and published Scotus Hiberniae restitutus (1660), once again asserting Scotus’s Irish origins. Good scholars as they were, they were probably wrong. Today we are pretty certain that Duns Scotus was indeed Scottish*, though up to the 19th century he was still being claimed for Ireland. We’re also convinced that Scottus Erigena was Irish. * Note: it’s been pointed out to me that some are not prepared to give up on Duns Scotus yet! If Irish, he was probably born in Co Down (Compendium of Irish Biography). This was an additional reason Irish monks worked on Duns Scotus’ philosophy, especially Hugo Cavellus, another Downman. 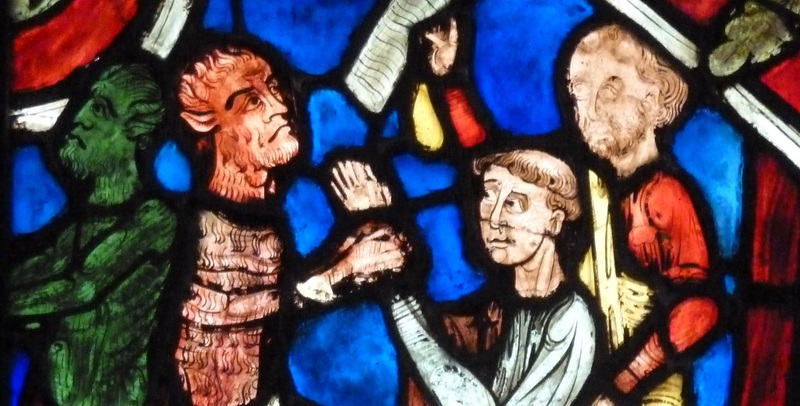 Featured Image: Devils and monks in stained glass. Medieval Stained Glass Collection at Cluny. (c) London Permaculture/Flickr, (CC BY-NC-SA 2.0).